Dylan Bennet Klebold was born in Denver, Colorado on September 11, 1981. He was the second child of Thomas and Susan and the brother of Byron, three years older. As a boy, he was in the Boy Scouts and was a pitcher on his Little League team. His parents told investigators that Dylan was a gentle boy and never gave any indications of a violent nature. Klebold attended Normandy Elementary School in Littleton, Colorado, for first and second grade and then transferred to Governor’s Ranch Elementary School where he was part of the CHIPS (Challenging High Intellectual Potential Students) program for gifted and talented children. Klebold’s parents told investigators he was somewhat sheltered at Governors Ranch Elementary and believed his transition to Ken Caryl Middle School was a little difficult for him because he was so quiet and shy. However, his parents thought the transition from elementary school to middle school is difficult for many adolescents and therefore they were not unduly concerned. During his earlier school years, he played T-ball, baseball and soccer. While at Columbine High School, Klebold became active in school play productions and operated the lights and sounds. He was involved in video productions and Columbine High School’s Rebel News Network. Klebold also became a computer assistant at school and helped maintain the school computer server. He also built his own home computer. According to Thomas and Susan Klebold, their son was extraordinarily shy and did not have a girlfriend but did socialize with different groups of friends. He and his group of friends were interested in video games, midnight bowling and fantasy football leagues. Klebold had few close friends other than Eric Harris. Klebold’s nickname was VoDKa with his initials capitalized. His friends generally described him as shy and quiet and somewhat of a follower. In most accounts, he was a typical teenager with an interest in video games, movies, computers and spending time with groups of other teenagers. According to friends, nothing in his behavior gave clues of what he and Harris were planning. Tom Klebold told investigators that, as far as he knew, Dylan never showed any fascination with guns. The Klebolds indicated that their son had dreams of being a computer science major and had been accepted at the University of Arizona. In fact, the Klebolds drove to Arizona with Dylan on March 25, 1999 to pick out Dylan’s dorm room. The Klebolds spent four days driving to Arizona and back to Colorado with their son and saw nothing unusual with his behavior or demeanor. But there was another darker side. 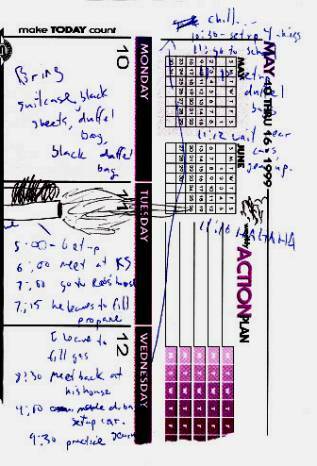 Klebold left behind glimpses of his thoughts in the form of notes jotted down in a day planner, a 1997 journal and writings in a math notebook and a yearbook. Klebold and Harris also left videotapes behind articulating many of their thoughts and plans. During one period Klebold’s tone briefly changed and he described his “first love.” It appeared that this was an unrequited love. Throughout his journal, Klebold named several girls he “loves” but he did not indicate that he ever actually spoke to any of them. He even went so far as to write letters to one girl but it appears he never sent them because they remained in his journal. Again in 1997 Klebold wrote that he wanted to die. He mentioned getting someone to buy him a gun so he could kill himself. 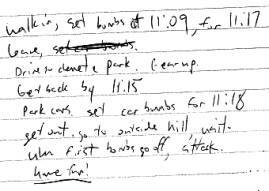 In November of 1997, Klebold described getting a gun and going on a killing spree. In April of 1998, at the end of their junior year, Harris and Klebold received their copies of the Columbine High School 1998 yearbook. A full year before their rampage Klebold made four entries in Harris’s yearbook. One such entry referred to “the holy April morning of NBK (Natural Born Killers).” Another entry says in part “killing enemies, blowing up stuff, killing cops!! My wrath for January’s incident will be godlike. Not to mention our revenge in the commons.” The January incident Klebold referred to is believed to be his arrest for breaking into a vehicle on January 30, 1998. The Columbine cafeteria is also called the commons. get out, go to outside hill, wait. When first bombs go off, attack. Eric David Harris was born April 9, 1981 in Wichita, Kansas, to Wayne and Kathy Harris. He had a brother, Kevin, who was three years older. Wayne Harris was in the U.S. Air Force and moved his family many times during the course of his career. In 1983 the Harris family moved to Dayton, Ohio; in 1989 they moved to Oscoda, Michigan, and in 1992 the Harris family moved to Plattsburg, New York. Wayne Harris retired from the Air Force, and in July of 1993 the family moved to Littleton, Colorado. Eric went to Ken Caryl Middle School where he met Dylan Klebold. Wayne and Kathy Harris told investigators that, as a child, Harris played soccer and baseball, and by the 7th and 8th grades developed an interest in computers. Harris was also interested in baseball cards, computer games and videos. His parents said that their son was content to be by himself but also had close friends in high school. While attending Columbine High School, Harris became involved in video productions and the school’s Rebel News Network as well as the school’s computer labs. Harris went by the nickname “REB.” This may have been short for “rebel,” which is also the name of the school mascot. As part of the diversion program, Harris wrote a letter of apology to the victim. In the letter, Harris apologized and explained how disappointed he was in himself for his actions. It seemed to be a sincere, heartfelt letter from a young man who had made a mistake. Harris also wrote a paper on anger management and how to control his anger. On March 18, 1998, the Jefferson County Sheriff’s Office took a “suspicious incident” report from Randy Brown, stating that his son, Brooks, had received death threats from Harris. These threats were reported to have been contained in Harris’ web pages. On his web pages, Harris also allegedly wrote about making and detonating pipe bombs and using them against people. Brown requested that he and his family remain anonymous in making the report for fear of retribution, particularly to his son. The information was reviewed by Sheriff’s investigators; however, Harris’ web site could not be accessed nor could reports of pipe bomb detonations be substantiated. Because of Brown’s request to remain anonymous, Klebold and Harris were not contacted. Further investigation was initiated but no additional information was developed. Because of the routine nature of the report and investigation, the former Jefferson County Sheriff, Ronald Beckham, was not informed of the report at the time. The District Attorney, subsequent to April 20, was provided with information from Harris’ web pages. After reviewing the report, the DA offered the opinion that, based upon the information in the report to law enforcement, there would have been insufficient basis to legally support a request to obtain search or arrest warrants. During the spring of 1998, Harris began his journal and wrote about how much he hated mankind and how much he loved his anger. Harris’ journal began in April 1998, and he wrote about how much he hated the world and his belief that he and V (Dylan Klebold) were different because they had self-awareness. Harris wrote, “I will sooner die than betray my own thoughts, but before I leave this worthless place, I will kill whoever I deem unfit…” He documented that he wanted revenge against anyone who he perceived had ever wronged him. In December 1998, Harris wrote that he would have been a good Marine, that “it would have given me a reason to be good.” Whether Harris truly wanted to be a Marine or if he used this as an excuse to avoid planning for a future he would never have is unknown. Harris did apply for enlistment in the Marine Corps, but the medication he was taking disqualified him. Harris also wrote in his own 1998 yearbook. He wrote on the photographs of almost every student words such as “worthless”, “die”, and “beat.” As he continued through the yearbook, he simply put X’s on those students who he did not like. Very few photos were not marked. An undated piece of notebook paper was recovered showing a diagram of the Columbine High School cafeteria with two X’s next to the pillars. Alongside the diagram was a timeline of how many people were in the cafeteria just prior to and during the first lunch period. Investigators will never know exactly when Harris and Klebold verbalized to each other their hate towards others and their desire to kill. However, it is clear from his journal that Klebold had those feelings as early as 1997, and Harris began expressing his thoughts in his journal in April 1998. It is also apparent from their cryptic yearbook messages to each other that they had already begun their plans for the Columbine shootings by April 1998 -- a full year earlier. There were also many common themes throughout their writings. Harris and Klebold both wrote of not fitting in, not being accepted and their lack of self-esteem. They reflected on natural selection, self-awareness and their feelings of superiority. They plotted against all those persons who they found offensive – jocks, girls that said no, other outcasts or anybody they thought did not accept them. Most of those teens were unaware that they had ever offended Harris or Klebold. Harris and Klebold left behind videotapes documenting many of their plans, their activities and their philosophies. One of the tapes was almost two hours long and taped on three separate occasions in March 1999. The second tape, about 22 minutes in length, was shot on two separate occasions on April 11 and 12, 1999. The third tape, 40 minutes long, was taped on eight separate occasions from early April 1999 to the morning of April 20, 1999. Harris and Klebold taped a tour of Harris’s bedroom and showed off their weapons and bombs. They recorded each other conducting dress rehearsals and they taped the drive in Harris’s car to buy supplies needed for their plans. While talking to the camera, Harris and Klebold laughed at how easy it was to make other people believe what they wanted them to. They talked about how “evolved” they were and how they considered themselves to be “above human.” They said they were going to be successful because they were going to die and stressed that they had been planning the Columbine shootings for over eight months, before all the other school shootings had occurred. There were also indications that Harris and Klebold initially planned the shootings to occur on April 19. They specifically mentioned Monday and another time said, “Today is the 11th, eight more days.” They never articulated why they chose the day they did and never mentioned that April 19 was the anniversary of Waco, Texas or the Oklahoma City bombing. They never verbalized that they even knew April 20 is Adolph Hitler’s birthday. Harris and Klebold seemed to have lived two lives. Their friends and family described them as normal teenage boys. Others described them as outcasts. But they left behind evidence of a much darker and sinister side. This darker side was an aspect they apparently shared only with each other. there are no prior adjudications. school reports are average or above with no reports of discipline problems. Prior to any termination the diversion officer gathers information from parents, school and runs a record check. The case is staffed with the full diversion team. Early termination is unusual because most diversion cases do not meet all of these criteria. An estimated five per cent of cases are terminated before the 12-month period.